Castle of Elite is a great 2D puzzle game similar to Chip's Challenge. The plot: "You are stuck within the halls of an ancient castle, and must get out. However, it's not going to be easy. The castle is made of many rooms filled with traps and obstacles. But that's not all that is stopping you. The traps and obstacles are arranged in such a way, rooms become lethal puzzles to solve. Featuring over 50 levels to complete of varying degrees of difficulty, completing the game is no mean feat." The highlights of Castle of Elite are excellent level designs, nice graphics, and a good user interface (although it takes some getting used to): you move your on-screen alter ego with the keyboard, and place and destroy bricks with the mouse. The first few levels are designed as nice tutorials to ease you into the game, and the help file tells you everything else. 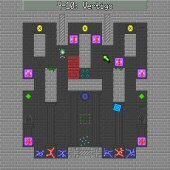 In addition to offering over 50 levels of increasing difficulty, Castle of Elite has a user-friendly level editor where you can create, edit and play your own levels. You can even share your own levels with friends via a simple text file. Although the overall game is solid, the secret Jumpman catapults it from solid to excellent in my opinion :) Highly recommended to puzzle buffs everywhere.